Troublesome Creek draining from underneath the Columbia Glacier. Just one of 700 such streams draining North Cascade glaciers. The North Cascades currently support approximately 700 glaciers. These glaciers store as much water as all of the states lakes, rivers, and reservoirs combined, and 25% of the North Cascade region’s total summer water supply. These are natural reservoirs that yield the most water during the driest period late summer. 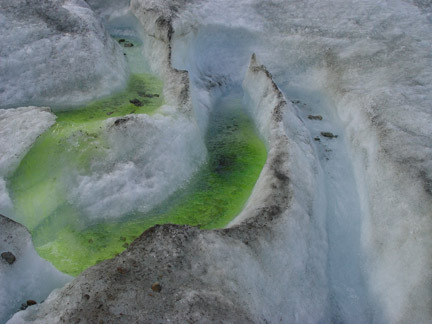 The amount of runoff provided by a glacier is the product of its surface area and ablation rate. Glacier runoff does not increase or decrease the long term runoff for a basin, total runoff over a period of several years is determined largely by annual precipitation. Glacier volume loss contributes to changes in streamflow, leading to an increase in overall streamflow if the rate of volume loss is sufficiently large, or a decline in streamflow if the area of glacier cover declines sufficiently to offset any increase in ablation rate. In some cases even in the same mountain areas glacier runoff has already peaked in specific watersheds and in other watersheds the peak may not occur until 2100 The complete melting of the Lewis Glacier resulted in a 75% decline in late summer streamflow at Lewis Lake. The North Cascade Glaciers release approximately 230 billion gallons of water during the summer. This water is nearly fully utilized for irrigation, salmon fisheries and power generation. With recent warming in the area glacier have been retreating. Many of these glaciers feed the Columbia River system. In the Baker Lake Basin glaciers provide critical water runoff. The difference in a hydrograph for glacier versus non-glacier basins is illustrated below. Glacier peak flow occurs when non glacier flow is approaching minimum values. The importance of glaciers is noted below for specific basins. Glacier catchments generate freshets that last longer, larger and peak higher than other alpine catchments, the glaciers acting as efficient reservoirs. Unfortunately the storage capacity of these natural reservoirs is shrinking as they retreat, which results in alpine streamflow changes. Comparison of streamflow from two adjacent USGS monitored basins Thunder Creek and Newhalem Creek, the former with 14% glacier cover the latter with 0% glacier cover highlight the impact of glaciers on streamflow. 1)Alpine runoff throughout the mountain range is increasing in the winter (Nov.-Mar. ), as more frequent rain on snow events enhance melting and reduce snow storage Streamflow has risen 18% in Newhalem Creek and 19% in Thunder Creek despite only a slight decrease, 1% in winter precipitation at Diablo Dam, within 5 km of both basins. The enhanced winter melt is evident in the 25% reduction in April 1 SWE at USDA Snotel sites. 2)Spring runoff (April-June) has increased in both basins by 5-10% due to earlier alpine snowpack melting. 3)Summer runoff has decreased markedly, 27%, in the non-glacier Newhalem basin with the earlier melt of reduced winter snowpack. 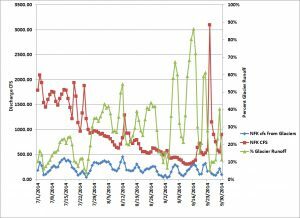 In Thunder basin runoff has in contrast increased negligibly, 4%. The difference is accounted for in part by enhanced glacier melting. The observed net loss of -0.52 m/a in glacier mass spread over the melt season is equivalent to 2.45 m3/s in Thunder Basin, which is 10% of the mean summer streamflow. This trend of enhanced summer streamflow by reduction in glacier volume will not continue as the extent of glaciers continues to decline. Thus, we see a trend of increasing alpine streamflow during the winter and spring, and a loss in summer streamflow in non-glacier basins, while enhanced melt in glacier basins is temporarily offsetting the loss. The glaciers are acting as reservoir supplementing flow. 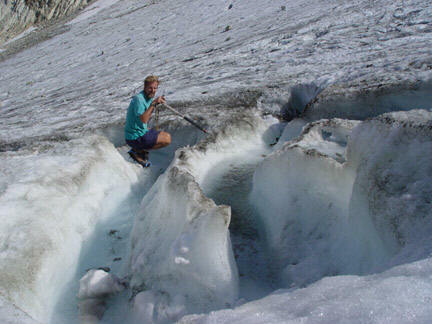 Measurements of glacier discharge are monitored on surface drainage basins on glaciers and beyond the terminus of glaciers. Dye is used to determine the velocity of the turbulent streams. Glaciers are natural reservoirs storing water as ice instead of using a dam. As they shrink so does the melting and consequent runoff they provide. The shrinkage of Ice Worm, Daniels, Chimney Rock and Lemah Glaciers are significantly reducing an already insufficient water supply. In August, 2005, with the entire Yakima River system tapped to the last drop and still short of meeting the desired flow rate for many irrigation districts, the Daniels and Ice Worm glaciers yielded 4.2 million gallons/day compared to 6.5 million gallons/day in the equally dry Augusts of 1986 and 1987. This is simply due to the reduced glacier area. But are the area’s water managers aware of the role that glaciers play and how their contributions are changing? Changes in glacier size are critical in determining glacier runoff. Declining Alpine Runoff in the summer is becoming a larger issue. In the last 40 years winter precipitation has not declined, yet April 1 snowpack has at the five long term USDA Snotel stations with reliable records over this period. This is due to more melting during the winter and more rainfall events even at elevation. This is further highlighted by the ratio between snowpack and total precipitation. The lower the ratio the lesser the percent of precipitation that is falling and being retained as snow. Both of these show a substantial decline from 1965-2006. As the snowpack diminishes to the point that only glaciers and a few small snow patches remain, alpine streamflow declines. This time of this transition noted in five North Cascade rivers has changed. The time is counted in days from June 1. Thus, 45 days would be July 15. The fewer the days the earlier the snowmelt season is concluding. 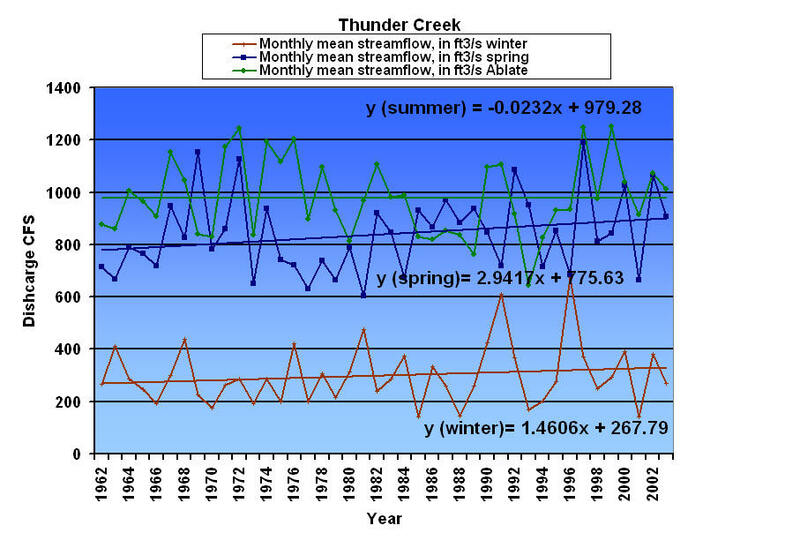 Mean monthly streamflow In Thunder Creek a glacier fed stream indicates a small decrease in summer streamflow and an increase in winter and spring flow. 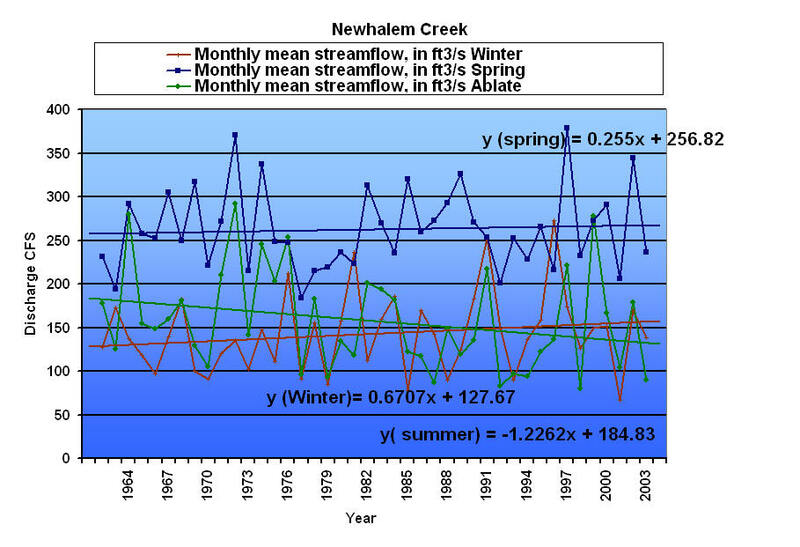 Mean monthly streamflow In NewhalemCreek a non-glacier fed stream indicates a large decrease in summer streamflow and an increase in winter and spring flow. In 1958 Hinman Glacier on Mount Hinman was the largest glacier between Mount Rainier and Galcier Peak, with an area of 1.3km2. By 1994, the glacier had seperated into three masses with a total area of 0.2km2, and these showed no evidence of movements and will quickly disappear. In 1965 Lynch Glacier on Mount Daniels had an area of 0.9km2, in 1992 the glaciers had shrunk to 0.5km2. The former location of the termini of the Lynch and Hinman Glaciers are now occupied by significant lakes, not yet in evidence on maps. How fast have North Cascades glacier been retreating? Examining the recent past in Mount Stuart area, 15 glaciers existed in 1969; today 12 are left, and of these four are on the verge of vanishing. At the turn of the century, Snow Creek Glaciers (Enchantments) comprised three ice masses separated by a narrow bedrock ridges and covered 2.0km2. Today, there are nine ice masses covering just 0.4km2. For five years we have with the Nooksack Indian Tribe measured runoff below Sholes Glacier as well as glacier melting on Sholes, Rainbow, Easton and Lower Curtis Glacier. The product of the observed glacier melt and total glacier area in the North Fork Nooksack River allows determination of overall glacier runoff. This is compared to the observed discharge at the USGS station on the North Fork Nooksack to determine the percent of runoff generated by glaciers in 2014. The percent glacier contribution peaked on Sept 15th and 16th at over 80% of total stream discharge. In 2014 there was minimal non-glacier snowpack remaining on Sept. 15th and there had not been significant precipitation in the previous 14 days. From Aug. 1 to the end of the melt season there were 21 days with glacier runoff providing 40% or more of the total runoff. There were no days in July where this occurred, indicating that non-glacier snow melt was still important. This is an illustration of the growing seasonal importance of glacier runoff to streamflow after August 1. The model for ablation can be enhanced with further field observations. This year we also had local air temperature measured at the gage sites. In time this local air temperature may provide additional comparative relationships that offer greater accuracy in ablation determination. Contribution of glacier runoff to the North Fork Nooksack River at the USGS gage. The most important finding is that the large local data set used in model construction and for model validation, allowed the production of a model that is both more accurate and more tightly constrained by actual field data than most models. Warm weather events are a focus, because it is low discharge and high temperatures that are stressful for salmon. There is a marked pattern of reduced temperature sensitivity and of enhanced discharge in basins with higher percentages of glacier cover during warm weather events. The result of continued glacier volume loss and glacier retreat will be a reduction in the enhanced discharge, leading to reduced flow during warm-dry low flow events. There will also be a greater sensitivity of the water temperature to warm weather events. In the North Fork between August 1st and October 1st, glaciers provided more than 30% of runoff for a majority of the days, and more than 40% of the runoff on 21 days.